Stamping Tink: 80's To The Max Release and Blog Hop for Sassy Studio Designs! 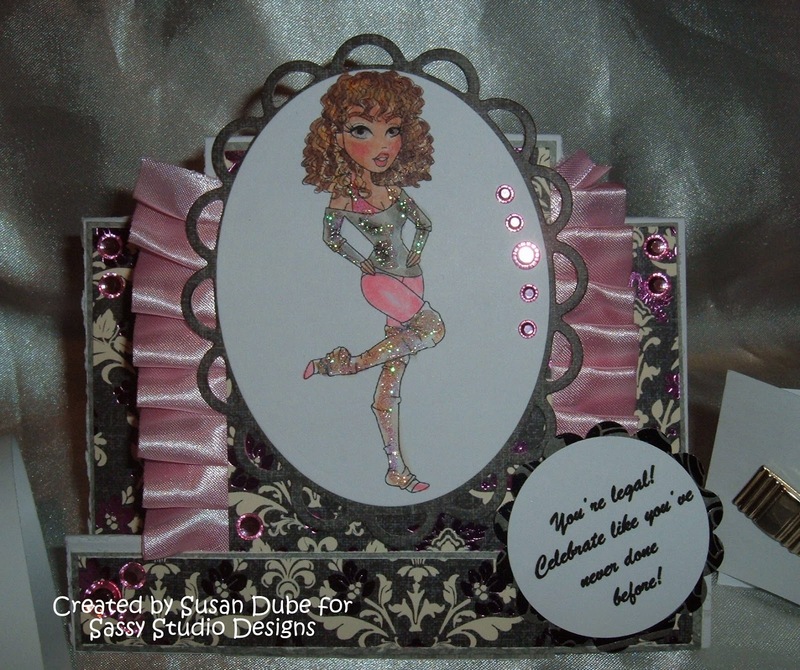 80's To The Max Release and Blog Hop for Sassy Studio Designs! Oh, "Close your eyes, hear the rhythm," how I love a good 80's song! "What a Feeling"! Anyone out there remember that? Well, I do! I'm a child of disco and loved it! 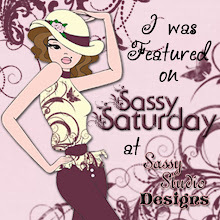 That's why I'm having so much fun with our new release from Sassy Studio Designs! The release is called "80's To The Max" and Lindsay has some fabulous designs for you! This release is really special because it's a celebration of what seems to be most of our design team's birthdays and we're so lucky to have one of our designing team sisters, Regan, back for this release! Our blog hop is including the outstandingly talented members of the Corrosive Challenge design team so we're really psyched about this release! Well, if you've come to my blog from my fabulous and very talented sister, Chris's blog, then you're on the right track. 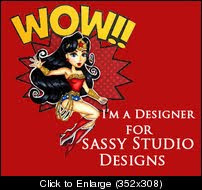 If not, boogie on over to the Sassy Studio Designs blog and start there. I don't want you to miss a single memory from the 80's with this release! OK, so from my first paragraph, can you guess what image I got to play with? Yep, I'm presenting Flashdance Sassy! I can just feel her energy! She's colored with copics and cut out with Spellbinders. 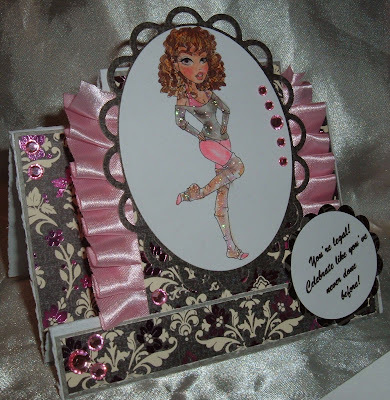 I made a center step card and used the gorgeous papers from the Black Currant paper pack from DCWV. The gems are from Studio G and the lace is from Cloud 9. Sassy and gorgeous, isn't she? I added some stickles to her leggings, sweatshirt and top. Here's a view of the shirt cuffs and cuff links. I love that part of the movie where Alex is having dinner with Nick and she takes her blazer off and is sitting there at dinner with her cuffs and tuxedo bow tie on! Actually, the cuffs are just some card stock with a hole punched into the middle and some cuff links put through them! Simple, but i hope they give the effect! I added a computer generated sentiment. I hope from the sentiment you can figure out what age this card is for! Just a couple more views of this sassy girl! Since Alex is on stage so much in the movie, I hoped the lace would kind of give the effect of a stage curtain. 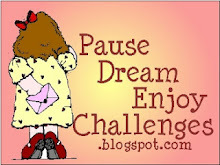 So now do the hustle on over to the uber talented Julie's blog and see what fabulous happening she has going on for you! 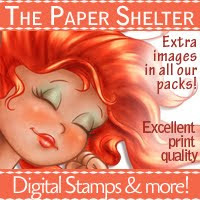 And remember, leave a comment every where so you get the chance to win a free image. These are such fun, I'd hate for you to miss out on the chance to get something free to play with! I hope you're having as much fun looking as we have had creating! Gorgeous card. I love the colors and your beautiful coloring. Love the bling, her outfit just sparkles. WOWZA girl ... I just couldn't wait to get over to your blog to see what you created and I was NOT disappointed! This is amazing and such fun! LOVE all the sparkle! Fantastic creation and fun hop .. thanks! The 80's was more my daughters era and this hop is bringing back many fond memories of her growing years. Susan, love the center step. The colors are so rich and classy looking. Your sentiment is great. Your "staging" of the card is great with the cuffs. So it was you, Susan, who borrowed my glitterly legging and forgot to give them back! You are so right, this does scream the 80's!!!! 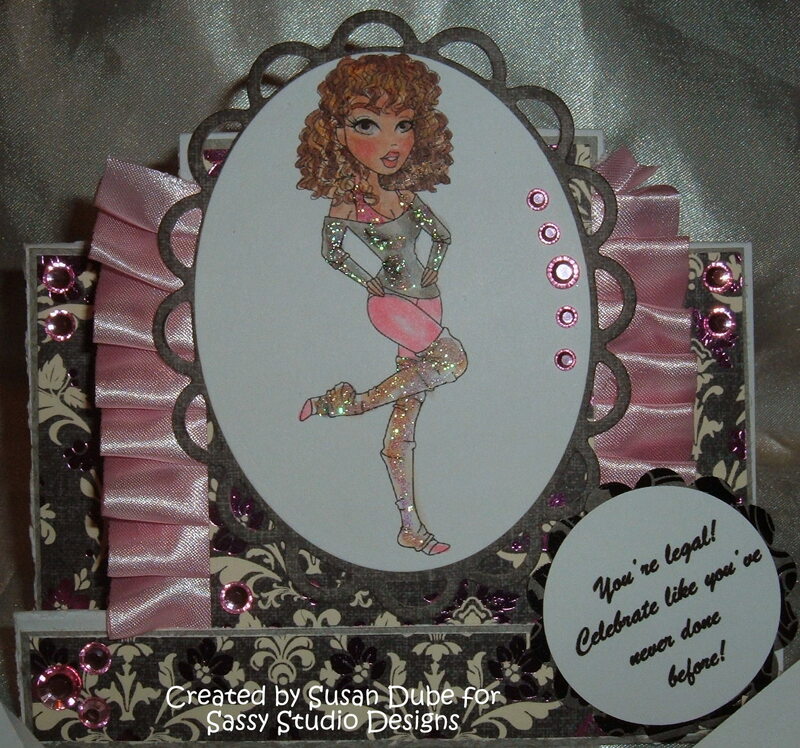 Love your use of bling and ribbon! Great job,Susan... Love the color choices - some of my favorites from back in the day... LOL! And those sparkly tights! Gotta love 'em. Great card! Love the colors, design, and all the shimmer! 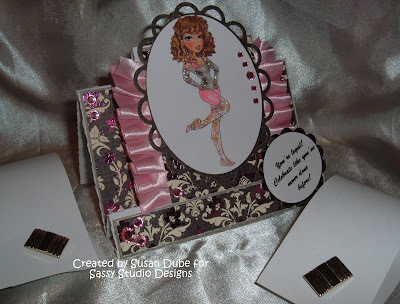 Beautiful card Susan, love the pink and the bling. Wow, I remember pink and grey being an 80's color scheme, LOVE IT!!! LOve all the sparkle too! Wow, Susan! Love all the sparkle and bling. Great color combo and that ribbon is so cool. Wow - gorgeous card. I love all the sparkle. Love the lace and bling. This is a great card. I kinda wish someone would contact some of the stars so they could browse through this hop and see these images and comments. THAT would be totally awesome. Susan your card and the image is amazing. I love your coloring. And the center step card gives a stage look to showcase your image. Gorgeous I love the design of your card and the color and bling are perfect. Beautiful Susan - I just love the bling! SO PRETTY!!!! LOVE everything about this - her glittery leg warmers (I had red ones! ), the pink ribbon and the cuff links...very clever (I forgot about that part of the movie!!) GREAT job!!!! Love all the sparkle and embellishments! Awesome card..... love the bling bling!!! Gorgeous card! Love her sparkly outfit. The pleated pink ribbon is beautiful! Lol I DO remember that song and now it's running through my head lol. Great card! I love the ribbon along the sides and of course the glitter! Fantastic! Beautiful, Susan! I love the runched ribbon and the sparkle!!! WOW oh WOW this is just stunning!!! Love the colors you have used and that ribbon is just fabulous. Love that pleated ribbon. 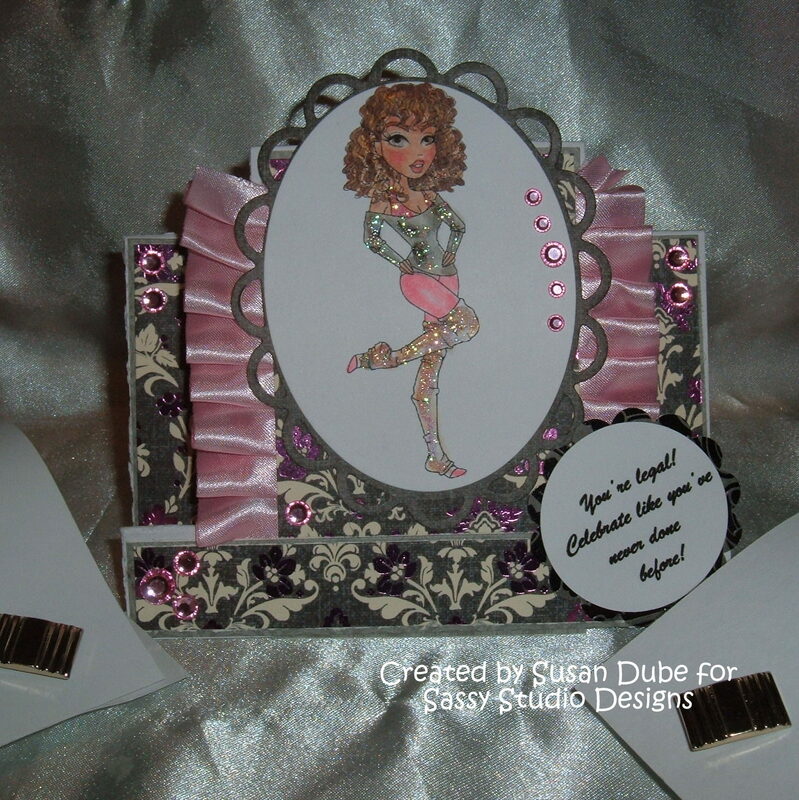 Great addition of Stickles to give a glitzy look to her. Super step card! A girl's just gotta have some bling! So pretty, TFS! 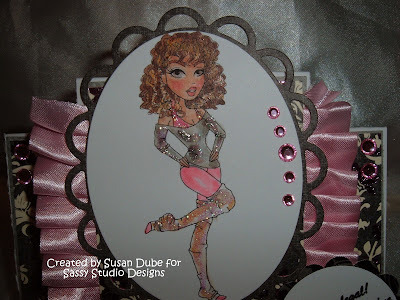 Flashdance Sassy is looking totally sparkly! Gnarly job! Oh my, this is just a fabulous creation, love it! My fave, I must say!